The recent Oscar-nominated film Zero Dark Thirty has gotten a bad rap, one that it doesn’t deserve. It has been criticized for being too pro-American, glorifying the war on terror and propagandizing for the Pentagon. These accusations are without basis. Zero Dark Thirty is a modern military thriller about the hunt for Osama bin Laden. Covering years of intelligence work by a CIA agent to find and kill bin Laden, the film has won well-deserved accolades, however some have criticized the film for supporting partisan politics and playing up the role of torture in the hunt for bin Laden. Those who have criticized the film as being American propaganda glorifying or justifying the War on Terror don’t know the film’s history. The film was originally intended to end with the failed attempt on bin Laden’s life in the Battle of Tora Bora, a distinctly downbeat ending. However, Bin Laden’s death came as the film was entering production and thus, the screenplay had to be radically altered. The original screenplay was going to feature America failing, and dramatically so. It was likely to be deeply critical, and the finished product retains much of that tone. Too many have criticized the film for making torture seem necessary, but the first clue that this criticism is off-base should be the darkness and horror with which the torture is presented. The film does misrepresent how torture was used as it is well documented that torture played little to no role in capturing bin Laden. But the film doesn’t seriously justify torture, as it leads very indirectly to a piece of information, uncovered by pure intelligence work which the CIA already possessed. The film’s scenes of torture don’t say that torture is absolutely necessary, only that it happened. Others have accused the film of justifying the American war on terror and supporting its thoroughly questionable policies. For a film that according to some, glorifies the CIA, America and the war on terror, the Americans are presented very negatively. Most of the time the CIA is reacting to events beyond their control. There’s a pervasive sense of desperation in most American characters, trying to find any way to strike a blow against international terrorism. Most of the senior officers and bureaucrats are incompetent, obtrusive or foolish. 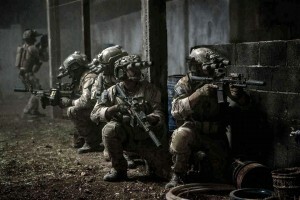 The film’s final minutes showing the raid on Osama bin Laden, are its most powerful, and they counter most of the claims made by the film’s detractors. We are meant to focus on the raid, and the violence. When the Navy SEALs finally reach bin Laden, the audience doesn’t even get to see his face. We spend more time on the crying women and children in the room.The final scenes aren’t jubilant. Nobody but the commando team says so much as a “congratulations.” In the last scene, Maya, the CIA agent sits alone and cries on a plane; clearly emotionally distraught.There’s no celebratory “we did it!” in the film, there’s only a lingering “what did we do?”Had the raid scenes been removed from the film and placed on their own, they would have made great anti-war short film. Zero Dark Thirty isn’t an apolitical movie — its subject matter would never allow it. But its greatest strength is its neutrality. The events are presented without slant, factually, in an almost documentary way. Accusations of pro-American bias, the endorsement of torture and a glorification of the War on Terror are fundamentally flawed.